Sometimes you have to dig deep to find something special. 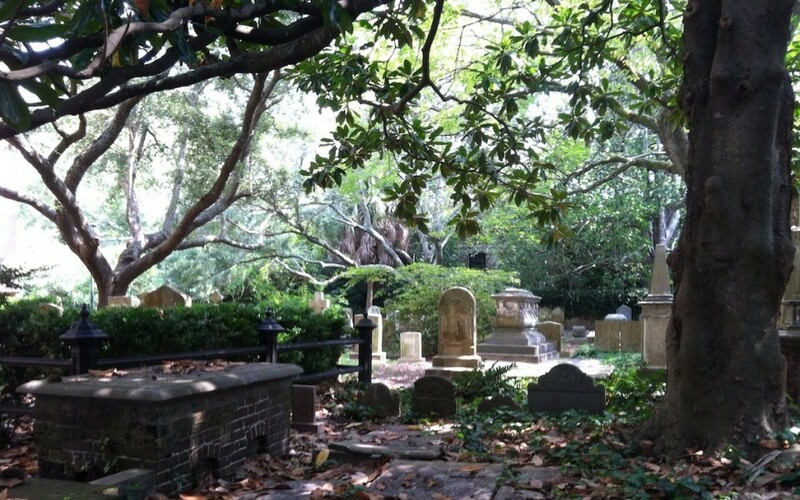 John Bayne, a kind reader of my blog, recently contacted me about a project he’s working on about Westview Cemetery. I wrote about Westview a few months ago. He had a list of famous people buried at Westview whose graves he hoped to photograph. As you can imagine, I was more than willing to help with that. In the course of that work this week, I discovered Madge Bigham. You’ve probably never heard of her. I had not until John gave me her name. No picture of her has survived. But in the early years of the 1900s, Madge Alford Bigham was a famous children’s author. She also founded the West End Kindergarten, one of the first of its kind in Atlanta. Her career, for a woman, was beyond her time. But today, she is largely forgotten or unknown. 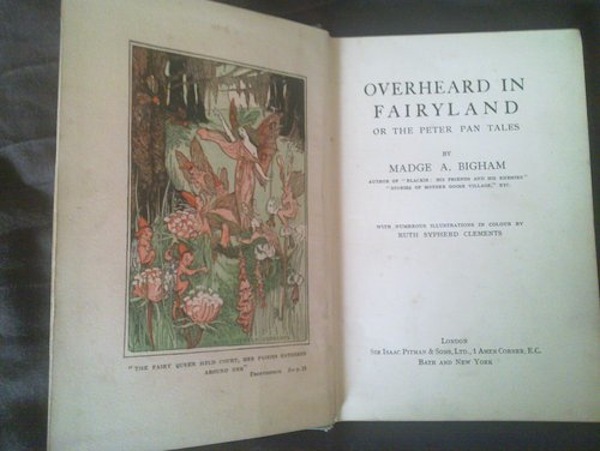 Overheard in Fairyland was one of Madge Bigham’s many popular children’s books. Madge’s grave was last on my list for the day and all I knew was that she was in Section 16, which contains taller stone monuments. You can even see some of the names from the road. But I couldn’t see a Bigham among them as I began to “hop” down the rows. An hour later, as I reached the front end of the section, I was tired, cranky and ready to leave. But my foot scraped an indentation in the grass. Not willing to give up on Madge, I got on my knees and began brushing and pulling away dead grass and weeds with my bare hands. Hidden under the grass, I found the narrow, flat gravestone for Madge’s sister, Eugenia Bigham. Beside her were Madge, sister Kate, and brother James. All of them were totally covered with a mesh of grass clippings from multiple mowings that had grown over them. Had I not stopped, I would have walked right over them. 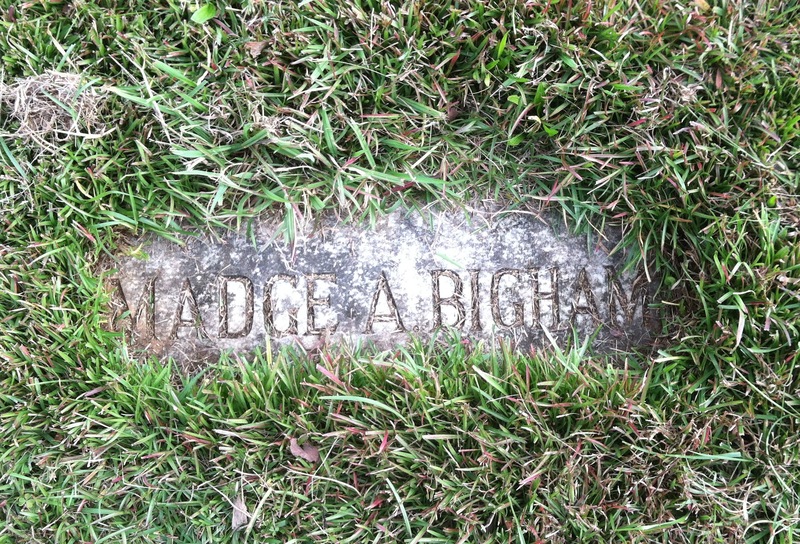 Madge Bigham’s simple, flat grave marker lay hidden under grass and dirt until I found it this week. She and her siblings were hidden from sight. Something told me there was much more to Madge than her simple grave marker. Later, I got on the Internet and started learning about an amazing woman who stepped outside society’s confines to teach children and share her imaginative stories with them. What I learned about her is mostly thanks to the efforts of Atlantan Tommy Jones’ blog, tomirtonics.com. What you read about Madge here came mostly from his research. Madge was the daughter of Methodist minister Rev. Robert William Bigham. When his first wife, Charlotte, died in 1871, Rev. Bigham was left to care for his eight young children. He remarried and the Bighams had at least four more children. Rev. Bigham wrote a number of children’s books himself, the most famous being Vinny Leal’s Trip to the Golden Shore. Madge was born in LaGrange, Ga. in 1874, and attended the Female Academy there. She continued her studies at the Lucy Cobb Institute in Athens. In 1896, she graduated from the Georgia Woman’s College (then in Covington). By 1902, she was principal of the Atlanta Free Kindergarten, located on Fort Street east of downtown. The first kindergarten in the United States was formed in 1856. Established in 1895, the Atlanta Free Kindergarten Association was part of an international movement that began in Europe in the 1840s. The Association’s president in the early years, Nellie Peters Black, was an advocate for free kindergartens and hospitals, enforcement of child labor laws, as well as for the admission of women to the University of Georgia and the Georgia Bar. 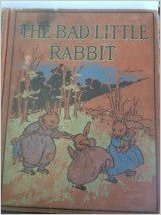 The Bad Little Rabbit was just one of Madge Bigham’s books that young children clamored to have read to them. Madge’s brother, James Whitaker Bigham, purchased a home on 124 (now 503) Peeples Street in Atlanta’s West End. James, along with his spinster sisters Kate, Madge and Eugenie, never married. The four siblings moved into the house and probably by 1911, they had added an addition in the back for Madge to open the West End Kindergarten. The house was near the Wren’s Nest, home of prominent author Joel Chandler Harris (who wrote the Brer Rabbit stories). By that time, Madge was already following in her father’s footsteps to become a noted author. Her first book, Stories of Mother Goose Village, was published in 1906. More books were to follow, including Sonny Elephant, Fanciful Flower Tales, and The Bad Little Rabbit. 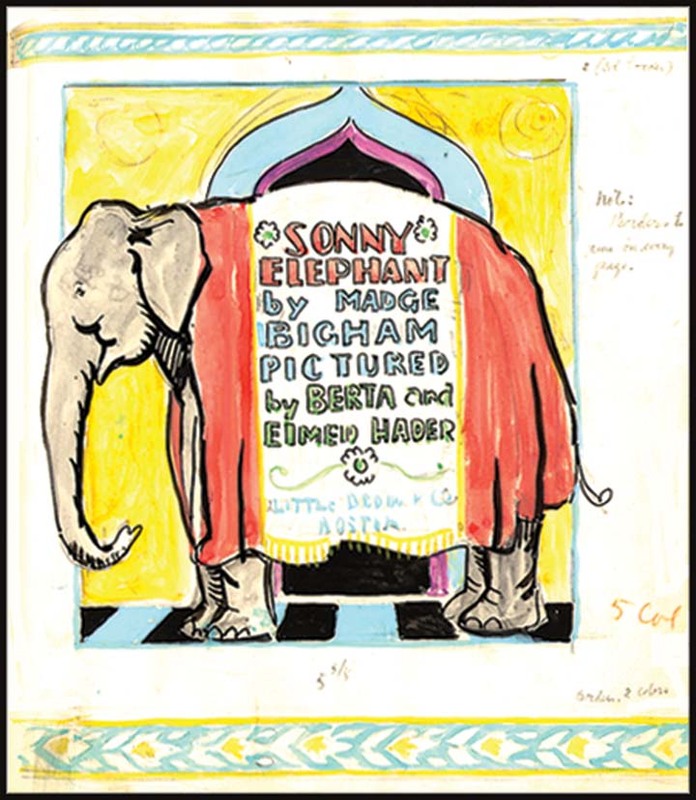 Sonny Elephant is a story about a baby elephant and his adventures. It is probably her most remembered book and was reprinted several times. Celestine Sibley wrote about one of Madge’s stories in her syndicated newspaper column in 1970. “The Story of How Apples Got Stars Within” comes from Overheard in Fairy Land. In the tale, a little apple tree loved the evenings when she could gaze at the canopy of stars stretched overhead. Her wish to have just one star of her own was overheard by the Fairy Queen, who promised the little tree that if she worked hard to grow straight and tall, she would get her stars one day. “That was a foolish wish of mine. 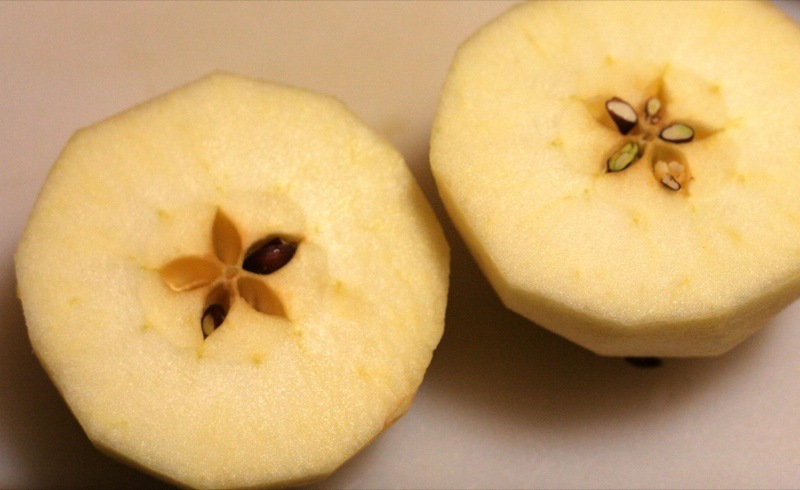 But if stars you have to give, give them, I pray you, to my baby seeds.” So that is why, when you cut your apple through the center of the circle side, you find brown baby seeds nestled in a five-pointed star. When the Great Depression hit in the 1930s, Madge was forced to close her beloved West End Kindergarten. Her other unmarried siblings died as the years went by and she found herself caring for the house with her brother Ernest’s widow, Mary, and their children. Madge died on August 11, 1957. This is thought to be the condition the house was in when Dr. Hammonds bought it in the late 70s. He died shortly after he finished restoring it. Photo courtesy of Tommy H. Jones. Eventually, the house (which was in such bad shape it had been condemned) was purchased by Dr. Otis Thrash Hammonds and completely renovated. 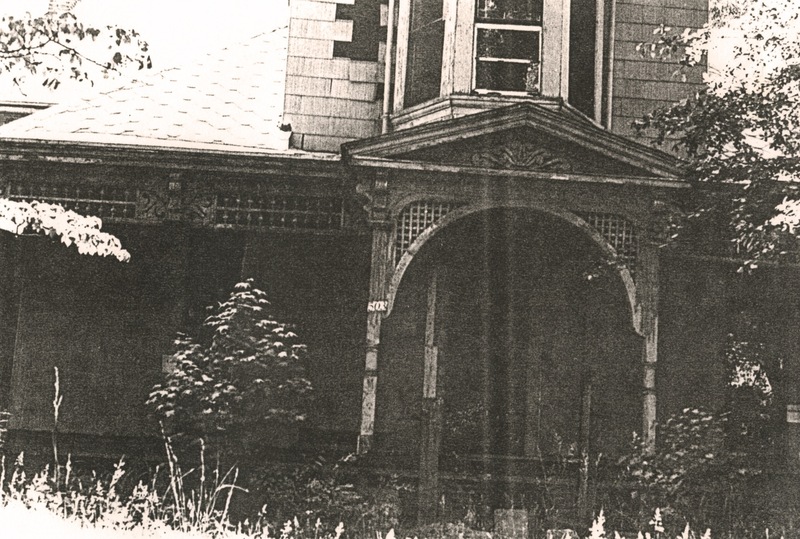 After the doctor’s death from leukemia in 1983, the house sat vacant until Fulton County purchased it. 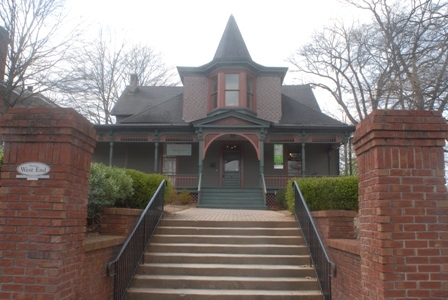 Today, it is the Hammonds House Museum and features Dr. Hammonds extensive African-American art collection. The sounds of children have returned to the house where Madge taught her students. Today, the Hammonds House Museum contains an impressive collection of African-American art. Much of it was collected by Dr. Hammonds over the course of his life. He died in 1983. Unlike Joel Chandler Harris, Madge Bigham’s name slid into obscurity. Occasionally, her books show up on eBay or in a rare book collector’s shop. Like her grave, her amazing life has become obscured in a modern era in which stories about heavily merchandised animated characters have upstaged happy little apple trees. I hope one day she gets the recognition she truly deserves. Don’t worry, Madge. I’ll be back to make sure you keep seeing those stars at night. Photo courtesy of Waldorf Homeschoolers. I love this one……what a great story to tell! Thank you for sharing this story about Madge Bigham and Dr. Otis Thrash Hammonds. Yes, children have returned to our halls and this house continues to teach. I was sad to read that Dr. Hammonds died so soon after the house’s renovations were completed. He really poured his heart and soul into the place. Many historic West End homes are long gone but this one remains a gem in the neighborhood. I was looking through my closet for some books to read and I found a 1903 copy of Stories of Mother Goose Village by Madge Bigham. I wanted to learn more about her and that brought me to this website. This is a great web site. I have 2 of Madge Bigham’s books. The one I know and love from my childhood is in very poor shape. The front and back cover are missing but based on Bigham’s introduction, I believe it is titled “Goober Village”. The characters look like peanut shells. My sister and I loved these stories. Always a chocoholic my favorite is “Pinder Peanut, Junior. The kid receives a little glass house filled with a family of chocolate rabbits and eats them one by one and gets sick and turns brown, etc. The second book I picked up at a used book sale. It is in good shape and entitled “Fanciful Flower Tales”. What I wouldn’t give to have a good copy of “Goober Village”. But alas, my searchings have not unearthed any. I stopped to visit Madge’s grave last week when I was at Westview. I was happy to see that her grave and those of her siblings were all in very good shape and not covered in grass. I always let her know I am thinking of her and say a little prayer before I go. I have a good copy of Goober Village by Madge Bigham. Contact me if interested. Hi Melanie. Yes I would be interested in the book u have. Please email me at leafrustle@verizon.net with details. I’m also interested in your book. I can be reached at donnahelengunter@yahoo.com. I’m so excited to find folks who have heard of Goober Village! I didn’t know before that the author had roots in Atlanta (like my family). I’m eager to learn more, and to see Madge’s other books. I’m always questing for Goober Village during my antiquing, flea market and yard sale adventures. Sometimes when we’re out, my Mother or I pretend we’ve found a copy – waving a small blue book high in the air – and it’s great to see each other’s reaction. I think the quest helps us keep the love of the book alive, and introduces it to other curious folks along the journey. Thank you for the information on Madge Bigham. My father received her book Goober Village when he was 3 years old, in 1936. He loved the stories and kept the book for his children. I also loved the book and shared the stories with my children. Now my children have children and the 4th generation will experience the same. I’ve spent over 25 years searching for a nice copy of that book that I could surprise my father with and have never found a copy. The family book is clearly well worn from its popularity/ repeated use. It is the best story book I have ever encountered, its illustrations are incredible, and each story teaches a worthy lesson. I always wondered about the woman that wrote these great stories and you provided an outstanding summary. Thank you so much! My mother, grew up 2 doors down from “Miss Madge” on Peoples Street in West End during the 30s and 40s. She spent many days in her home and to this day she has many fond memories of her. I have copies of all of her books and have read them to my children and grandchildren. My favorite is Sonny Elephant. Though I never met her personally, I have known about her all my life. Her books are being republished due to a lapse in copyrights and I hope maybe others will find joy in her works like I have over the years. Mark, thank you for taking the time to comment. What a blessing to have her books and that your mother was her friend. I know it’s a legacy your children will carry on with their children. Does anyone have Goober Village for purchase in 2017? If so I’d like to buy it! Cobb County’s Switzer Library has a “Georgia” room with another Madge Bigham book you can view, but it’s not ‘Goober Village’. It is surprising I didn’t find your blog earlier because I searched for information on Goober Village since the birth of the internet! I did find a battered copy online – and was able to pay what you may think was an exhorbitant price. But I was happy to hold it in my hands again. I am 72 and grew up in Atlanta with 2 sisters; we all loved and longed to see this book again. I have also searched for info on Madge and found a fair amount. Thank you for this – it will add to my reference! Wonderful article, thank you for sharing. Marietta, Georgia’s Main Library on Roswell Street has a Georgia room with at least one book by Madge Bigham that can be read there. Hi, Donna! Glad you enjoyed it! 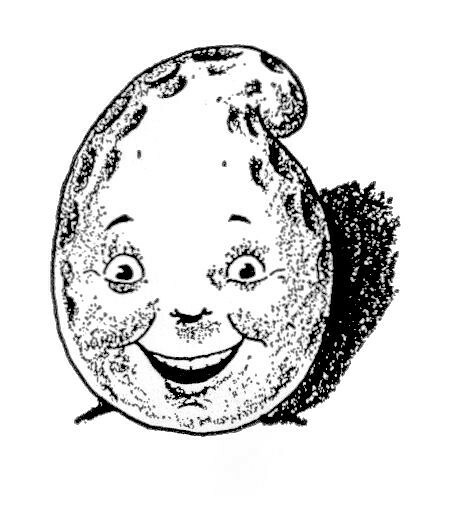 Does anyone recognize the character Margold Nubbin Peanut from Madge’s books? I loved this story when I was a girl in the early 60s. The book had a cloth cover. The characters were peanuts so eventually got to this site. It’s very exciting to meet anyone who remembers Goober Village! One of my sisters has been taking book repair classes and she did a minimal repair on the one I found – enough to stabilize the spine and covers. Wish I had some grandchildren to read it to. I could send you some pictures of the illustration. I would love to be able to add some pictures from the book Goober Village! Just send them to traci.rylands@gmail.com. Thank you!